And just like that my vacation week is over. Of course it went too fast. Taking the sting off of being back to work though is the fact that I only work two days this week thanks to my garage sale this coming weekend and that we get exciting news this week in learning the gender of our baby. Inspiration Monday with two birds also always takes the sting off of Monday. Today's look is from Olivia Palmero. I fell in love with her necklace! My look is a very loose interpretation - I just can't do all white! 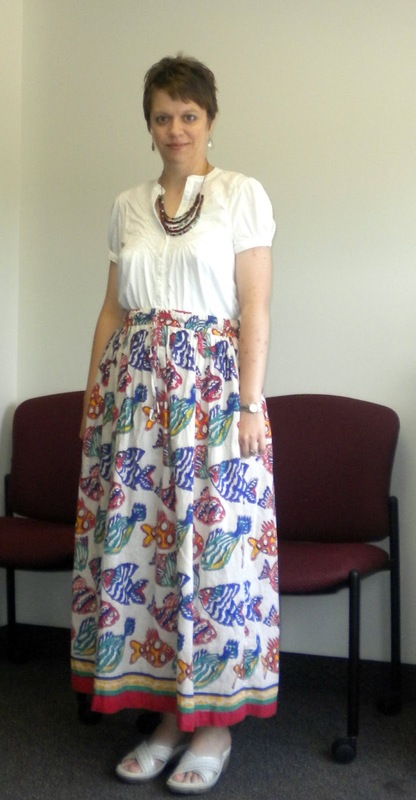 So, I chose a white shirt, a fun new skirt I picked up at the Tandem Vintage sale right before I went out of town and a necklace that I felt matched the interpretation pretty well! I like the way it looks in person and it's definitely comfy, but these pictures are making me look like frumpy pregnant girl (EDIT - scroll down for a better look). Oh well. I gave it my best shot! It doesn't help that my hair also feels like a hot mess today. I think it'll be time for another haircut already. Darn prenatal vitamins. 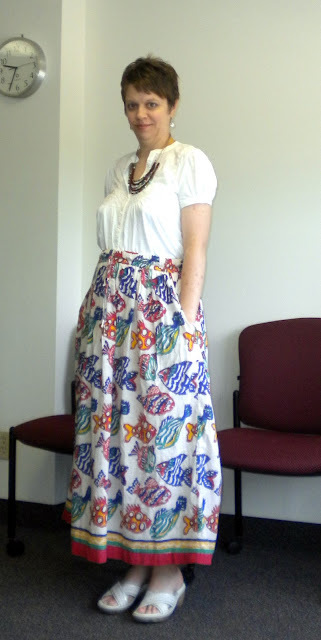 I do absolutely love the print on this skirt - fishies! Too much fun. I think next time I'll pair this with a more colorful top and I think I'll like the overall feel a bit better! This skirt will work post-pregnancy too. It has elastic and a drawstring. You just can't beat it. Well I'd better hop to it, lots to catch up on! Make sure you head over here to two birds to see other interpretations for Inspiration Monday that I'm sure are far better than mine! EDITED to add - So, based on feedback I already received today, I realized the answer to my frump feelings was simple - TUCK IT IN! It always makes a huge difference! See? WAY happier with this look. Thanks to Sharon of the Tiny Heart and Heather from Style Journey for that super simple suggestion that I should have tried right away!! Welcome back!!! Yay for another short week! You look so cute! <3 Love the fish print, too. :) And, I had a PILE of stuff for you at the sale and forgot to give it to you! After you left, my palm immediately slapped my forehead! :( I will bring it all to karoake for sure! That skirt is so cute!!! I bet this would look cute if you hiked it up as a dress and belted it to show off your baby bump :) So jealous you have a short week too! You look so cute and THAT SKIRT! I LOVEEEEEEE! What an adorable print! I would have suggested tucking in as well - cute outfit! Glad to have you back. I have discovered the tuck in trick lately too haha Don't know why it doesn't always occur to me. You look lovely! Man when I was expecting I lost my waistline first. dang you look GREAT! I WANT TO KNOW YOU BABY'S GENDER, TOO!!!! Thank you for your nice compliments on my white shorts and weight loss. I love CELEBRATING weight loss any day. I'll lose and you gain, k? I missed you many times last week. I knew you would be back. Good call on tucking -- we don't want you to feel frumpy, only fantastic! You could also try belting above or below the bump (http://www.academichic.com/2009/08/04/es-maternity-style-recap-highlight-reel/) My sister struggled with pregnancy dressing until I passed along the Academichic blog to her -- so sad they don't post any more! I am obsessed with tucking things in! When I was younger I thought it was a weird, stuffy thing to do. Thank goodness I grew right out of that and I've been tucking ever since :) haha. What a cute printed skirt :) Plus it has pockets which always makes any garment better! Totally totally cute fish skirt!! Yeah, I like the blouse tucked in better. yes, i love it tucked in...it shows off your cute figure more!! That skirt is super cute! And I do like the tucked in look better!